Ian went to medical school in Cardiff and junior surgical posts were completed in south Wales. 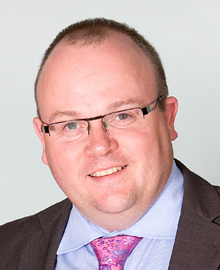 Having rotated through the SW Thames Surgical Rotation, Ian spent a number of years in Basingstoke and then Oxford, before being appointed to Exeter in 2006 where he continues to practice. His breakthrough in research was the MERCURY Study of MRI staging and this influenced his surgical career that now focuses on advanced disease, low rectal cancer, recurrent disease, intestinal failure, surgical complications and abdominal wall reconstructive surgery. Ian travels widely lecturing and performing surgery on low rectal cancer and complex hernia cases. As Honorary President of the Colostomy Association, Ian has a research interest in stomas. Ian works closely with Mr Neil Smart and colleagues in Exeter as they develop their unit as a centre for Colorectal surgical excellence. Smart NJ, Marshall M, Daniels IR. Biological meshes: a review of their use in abdominal wall hernia repairs. The Surgeon 2012: 10; 159-71. Smart NJ, Daniels IR, Marquez S. Supplemental cross-linking in tissue-based surgical implants for abdominal wall repair. Int J Surg 2012 Aug 3. Smart NJ, Daniels IR. Biologic meshes in colorectal surgery. Colorectal Dis. 2012: 14; Suppl 3 3-4. Marshall MJ, Smart NJ, Daniels IR. Biologic meshes in perineal reconstruction following extralevator abdominoperineal excision (elAPE). Colorectal Dis. 2012: 14; Suppl 3 8-12. Godden AR, Daniels IR, Giordano P. The role of biologic meshes in abdominal wall reconstruction. Colorectal Dis. 2012: 14; Suppl 3; 7-11. Smart NJ, Bryan N, Hunt JA, Daniels IR. Porcine dermis implants in soft-tissue reconstruction: current status. Biologics. 2014: 10; 8: 83-90.